Per his military service record (regimental no. 4729), Robert Ayres was born at Surrey Hills, N.S.W. He gave his age as 41 years and 11 months, his marital status as married, and his occupation as cab driver. His description on his Certificate of Medical Examination was height 5 feet 5 ½ inches tall, weight 140 lbs., with a fair complexion, blue eyes, and fair hair. His religious denomination was Wesleyan. He claimed to have no previous military service. He completed his medical examination at Ashfield on 11th November 1915. He was attested by Lieutenant F. Middenway when the Coo-ees were at Ashfield on 11th November 1915. On his embarkation roll his address at time of enrolment was 2 Mill Street, Croydon, N.S.W. His next of kin was listed as his wife, Mrs M. [Martha] Ayres, at the same address. On 8th March 1916 Private Ayres, along with many of the other Coo-ees, departed Sydney on the HMAT A15 Star of England. He arrived in Egypt on 11th April 1916. On 7th of June 1916 Private Ayres left Alexandria aboard the H.T. Ionian bound for France. He arrived at Marseilles on 14th June 1916. He joined the 13th Battalion in France on 19th August 1916. Ten days later, on 29th August 1916 the 13th Battalion was in action around Mouquet Farm, France. During the previous 24 hour period the 13th Battalion was under heavy artillery fire, and had suffered a total of 18 killed, 99 wounded and 33 missing. Private Ayres was one of those wounded, being evacuated to a Casualty Clearing Station suffering Shell Shock. On 6th September 1916 Private Ayres was sent to the 3rd Convalescent Depot at Etaples, France. On 9th September 1916 he marched into the 4th Australian Division Base Depot at Etaples. On 7th January 1917 Private Ayres re-joined the 13th Battalion when it was at Mametz, France. On 29th January 1917 Private Ayres was detached for duty at the Corps Baths at Heilly, France. On 20th April 1917 Private Ayres was sent to hospital. He re-joined the 13th Battalion on 26th April 1917, when it was training at Ribemont, France. On 14th September 1917 Private Ayres was detached from the 13th Battalion for duty at the 4th Australian Division Base Depot at Le Harve, France. He arrived on 16th September 1917. On 26th September 1917 Private Ayres was transferred to England. He arrived at Weymouth, England, on 27th September 1917, where he marched into the No. 2 Command Depot. Private Ayres departed England on 31st October 1917 for return to Australia, suffering senility, aboard the H.M.A.T. Berrima. He disembarked at Sydney on 31st December 1917. Private Ayres was discharged medically unfit on 31st January 1918. Australian War Memorial. First World War Embarkation Roll, Robert Ayres, 4729. Australian Imperial Force unit war diaries, 1914-18 War – AWM4 Subclass 23/30 – 13th Infantry Battalion, August 1916. Australian Imperial Force unit war diaries, 1914-18 War – AWM4 Subclass 23/30 – 13th Infantry Battalion, January 1917. Australian Imperial Force unit war diaries, 1914-18 War – AWM4 Subclass 23/30 – 13th Infantry Battalion, April 1917.
Who were the 22 Ashfield recruits? The Coo-ees held a recruiting meeting, and stayed the night at the Drill Hall at Ashfield on Thursday, 11th November, 1915 – their last night of the Coo-ee March on their long route from Gilgandra to Sydney. This is now the site of the Ashfield Boys High School gymnasium, and a new car park named Coo-ee Car Park in memory of the 1915 Coo-ee March built recently by the Wests Ashfield Leagues Club. 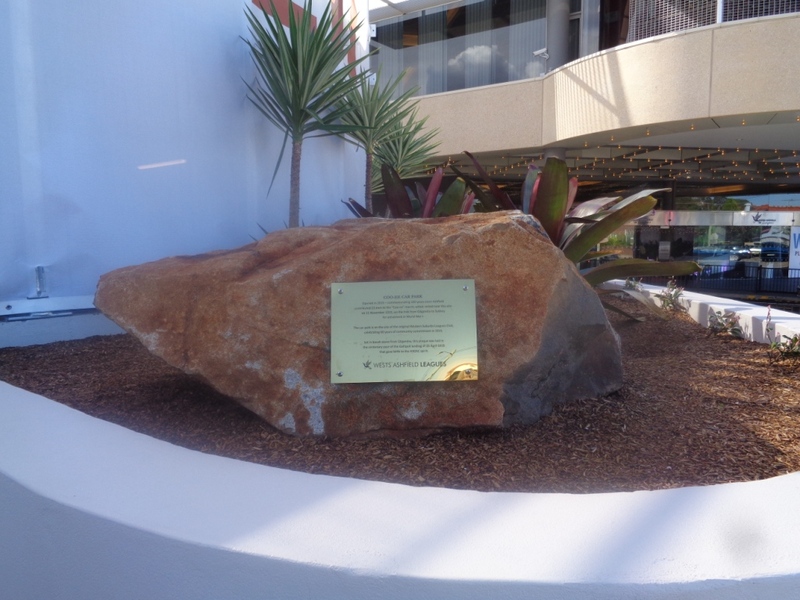 A plaque about the Coo-ees at Ashfield was unveiled at the Coo-ee Car Park on 21st April 2015. 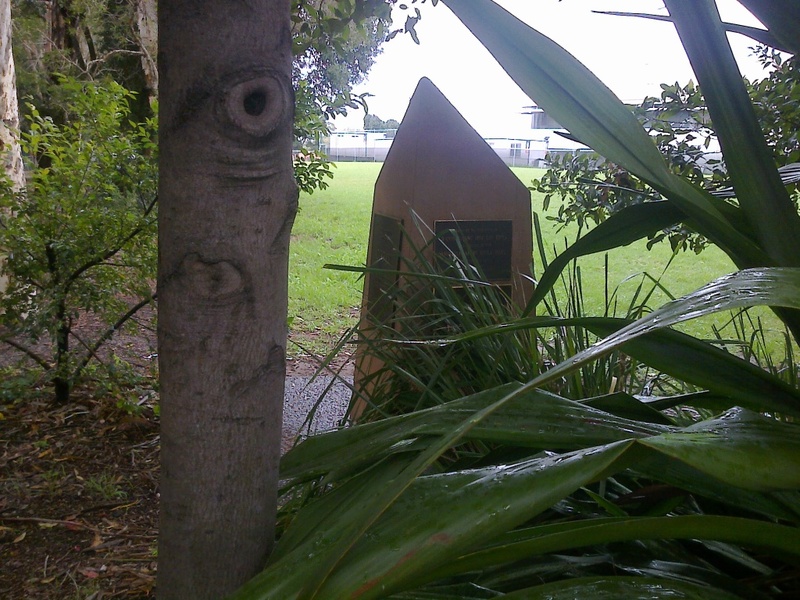 A plaque on an obelisk is situated in the grounds of the Ashfield Boys High School. It has been there for some time. On it are the words: “Celebrating Gilgandra Coo-ee Marchers 11 November 1915 22 Ashfield men joined with the Coo-ee marches here on this day”. Although the “official” count for the total number of Coo-ees recruited on the 1915 Gilgandra to Sydney Coo-ee March per newspaper articles of the time was 263, with Ashfield having a total of 22 recruits, the Sydney Morning Herald reported on 13th November 1915 (p. 19) that ‘the contingent left the western suburb’ of Ashfield ‘about 263 strong, but there are others now to be sworn in – men who joined the little army yesterday.’ The Farmer and Settler reported about Coo-ees numbers on 21st December 1915 (p. 3) that ‘there were no fewer than 277 men on their last pay sheet in camp’. We have found the following names of 23 men who were attested at Ashfield at the time the Coo-ees were recruiting at Ashfield. We note that one (Bert Kilduff) had paperwork dating only from 12th November 1915 in his service record, so perhaps the ”official” count of 22 recruits was taken the night before at Ashfield, and he was not included. Although two others also completed their medical examination and signed their attestation paper at Ashfield on the 12th November 1915 (Thomas Edward Bow and Charles Seal), they had both signed the bottom of the first page in their ‘Attestation paper of persons enlisted for service abroad’ on the 11th November 1915. Not all of these men were local to the Ashfield area. Some were men who had joined the Coo-ees earlier in the march, or caught up with them at Ashfield, who signed their attestation paper to enlist in the Australian Imperial Force at Ashfield. William Ellery was reported to be a long term resident of the Dunedoo area before he left to join the Coo-ees. Edgar Dawson started filling out his paperwork in his service record in Bathurst. Jack Wiggins was known as a Springwood recruit. Sam Luke joined the Coo-ees at St Marys. Selby Megarrity undertook his medical at Penrith, the day before the Coo-ees arrived at Ashfield. Fourteen of the Ashfield recruits embarked overseas with the majority of the Coo-ees on the transport HMAT A15 Star of England on the 8th March 1916. Five more embarked on other ships soon after. An individual blog entry will be added to this website for each of the above named Coo-ees.